The cable television operators in Singapore has been facing intense competition from OTT players like Netflix and have been fighting back by beefing up their content offerings or through innovation. 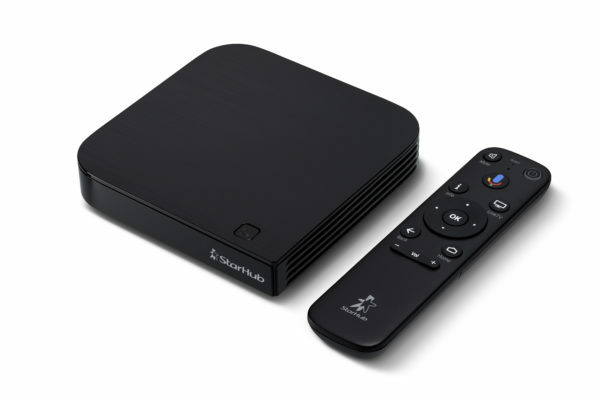 On this note, StarHub recently unveiled the StarHub Go Streaming Box, their new Android TV box. The product is touted as an all-in-one entertainment destination that combines StarHub’s content catalogue the the Google Play store. Powered by the Android TV Oreo operating system and compatible with any wireless broadband connection, the box comes preloaded with a Go Family subscription, which includes over 50 channels. Featuring content optimised for the big screen, the box is integrated into the StarHub Go ecosystem, allowing customers to seamlessly switch viewing between their TV set and smart devices. The target market would be those who would want to access StarHub’s arsenal of content while being able to enjoy streaming services from Android apps as well. This would probably be multi-generational family whereby there are the older age group comfortable with the content offering on StarHub cable channels and younger family members who want to view web streamed content on a large screen television than on smaller laptop or mobile phone screens. The box is specifically made for connecting to a television and loads up a customised interface that showcases StarHub’s slew of content offerings. This is perfect for those who don’t own a smart TV. Our evaluation is that this product is catered for a very specific group of target audience in mind – multi-generational family who love StarHub’s content offerings, but also want to stream web content together on the same screen. The StarHub Go Steaming Box is the first in the world to run on the Operator Tier version of Android TV Oreo. Operator tier permits operators to provide customers with a customised user interface. One of the advantages is that titles from StarHub Go packs are aggregated onto a ’discover’ tab and categorised according to genre, allowing customers to explore and discover content without the hassle of navigating through separate tabs. Each purchase of the StarHub Go Streaming Box comes with a Go Family subscription, which includes over 50 live TV and catch-up channels from a variety of content genres. Some of the channels available are Hub E City HD, Hub VV Drama HD, BBC Earth HD, tvN Movies HD, Lifetime HD, GEM HD, Cartoon Network, Oh!K HD, CuriosityStream HD, and BBC World News HD. Customers looking to upsize their content on top of their Go Family subscription can subscribe to other StarHub Go packs like Go Select, Go Sports, Go Disney, Catchplay Unlimited, HBO GO on StarHub Go or third-party applications like FOX+. For TV aficionados, Go Select offers access to thousands of TV shows including Korean movies and dramas, TVB dramas, up-to-date Asian programmes, HBO Originals and more. With full seasons and episodes of shows like Game of Thrones, Chicago Fire and Legend of Fuyao available, customers can binge-watch on Go Select to their hearts desire. Go Sports gives sports fans a front row seat with the live coverage of La Liga, ATP tour and WWE. Customers can be transported to the happiest place on earth with Go Disney and enjoy brand new episodes and full series from Disney Channel, Disney Junior and Disney XD. Catchplay Unlimited delivers the top cinematic experience for movie fanatics with its huge variety of blockbusters and movies. Customers can catch the best of HBO from the biggest blockbuster movies to most-talked about HBO originals with HBO GO on StarHub Go. Related Post: Read about Sports Hub's switch to plastic grass on CNA? It just disappeared. Customers can head to the StarHub Online store or any StarHub Shops to sign up for the StarHub Go Streaming Box. Customers can sign up for StarHub 1Gbps Fibre Broadband at $39.90 per month and top up $14.90 per month to enjoy the StarHub Go Streaming Box with 24 months of Go Family subscription, with a 24-month contract. Customers who sign up for this will also receive the new Linksys EA8100 router worth $329 at no additional cost. Alternatively, the box is also available as a stand-alone product at an introductory price of $199 (U.P. $249), with a complimentary Go Family subscription of six months. The StarHub Go Streaming Box comes with a one-year warranty, which begins at the point of purchase. StarHub National Day Free Preview includes Thor: Ragnarok, Coco, K-Drama and a lot more!